What to do, what to do...! A group of school children just came in, all clamoring for the Guinness Book of World Records, any Guinness Book will do, but they're all checked out! Stop. Take a deep breath. And hand them Do Not Open. 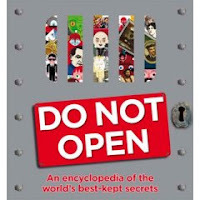 Purported to be "an encyclopedia of the world's best kept secrets", this book is that and more. It covers everything from Airforce One to how to "decode" a bar code, to the Kremlin, to theories comparing Abraham Lincoln's assassination with JKF's assassination. It is visually appealing? Boy howdy, it is! Each topic is generally covered on a two-page spread (for some of which you have to turn the book around and look at it vertically). These spreads are chock-full of photos, cartoons, maps, and more. There are lift-the-flaps, pages that fold out to create giant spreads, even Magic Eye pictures. Do Not Open also employs a sort of website-y, choose-your-own-adventure-y linking style. At the beginning of the book it tells you that you can either just read straight through or check the bottom right of the pages and it'll give you some other pages to turn to that present similar info. For example, on the spread that presents Cheyenne Mountain, it says "Want to check out some more amazing complexes? Look at Kremlin on pp. 66-67, Vatican on pp. 88-89, and Forbidden City on pp. 204-205." It's an interesting way to link entries in the book, although it didn't really work for me. My problem was I'd read an interesting section, but instead of wanting more info on spies or presidents, I'd want more info about aliens and those pages weren't "linked". Maybe kids will find it more useful. As for myself, I browsed straight through and that was fine for me. Although there's a pretty lengthy "Acknowledgments" page, exact sources aren't noted. It's understandable. With so many entries about so many different things, the source list might be as long as the book itself. The format and conversational tone make this book a great choice for browsing and recreational reading. However, be warned that you might come across some information you could have lived without, such as this passage in the entry on dirt: "Human skin flakes make up 80 percent of the dust in beds and carpets. House dust mites feed on these skin flakes. Up to 10 million dust mites share your bed each night. The average house dust mite poops 20 times a day. About 10 percent of the weight of a two-year-old mattress is dead dust mites and their feces. Sleep tight!" Read more reviews over at The Well-Read Child, The Imperfect Parent, Breeni Books, BoingBoing, and Bookgasm. It's Nonfiction Monday! Check out the roundup at Picture Book of the Day!